Rejoice metalheads as Sabaton (once again) invite you to a mass slaughter, hurdled on by massive riffs, grandiose symphonic tempered tunes and epic choruses drenched in floods old world heroism inspired poetry, this time imaged on the rise and fall of the Swedish empire. So what else is new you might ask? 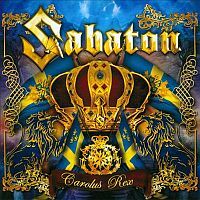 All mentioned are indeed rudimentary elements of trademark Sabaton artillery, still “Carolus Rex” undoubtedly takes that extra step up the ladder. Things get of to an expected start with “The Lion From the North”. This is a ferocious, for sure perfect showcasing of trademark sound Sabaton have laboured sturdily for through the years. “Gott Mit Uns” follows in tremendous fashion, echoing sword slinging epic metal. “Killing Ground” is another choice track, an exercise in brilliant heavy metal with an epic twist, leaving “1648” no alternative than to burn with the same intensity – or simply die out. And while with most power metal acts revelling in battle cries while galloping towards eternal glory have a tendency to get predictable this is not the case with “Carolus Rex”. Epic riffs, sing-along choruses and accomplished, theme oriented guitar solo are all well in place with the agile song composition on the tittle number. And it isn’t all about riff charging through the power metal heat haze. Apart from cut and shaved modern metal heaviness presented, Sabaton show signs of newly grown maturity blossoming through song-writing on ”The Carolean’s Prayer” where an Iommi inspired guitar riff is brought to life carrying the full weight of colossal melodies. An almost mainstream rock sense for melody is present on “Long Live the King” and put to great effect in the process partnered by venomous riffing, choir like choruses and symphonic keyboard work. A reinvention of the genre it ain’t, but it sure goes to prove just how resourceful Sabaton can be. Power metal devotees will no doubt get instantly hooked on this strong collection of Nordic battle cries. With the right ingredients – strong song-writing, inspired band performance and excellent production work from this is Sabaton’s Holy Grail.